This week Sky Vegas casino is giving you the chance to win a guaranteed prize when you stake £20 or more at the casino. All you have to do is opt in to the promotion at the casino this week and then bet at least £20 on your favourite slot or instant win game during the promotional period. Then check back at the casino on Monday 12th September and you will find out how much money you have won. The top prize is a massive £5,000, there are 2 prizes of £2,000, 3 prizes of £1,000, 5 prizes of £500, 6 prizes of £250, 10 prizes of £100, 20 prizes of £75, 100 prizes of £50, 100 prizes of £25, 500 prizes of £10, 1000 prizes of £5 and unlimited prizes of £1. 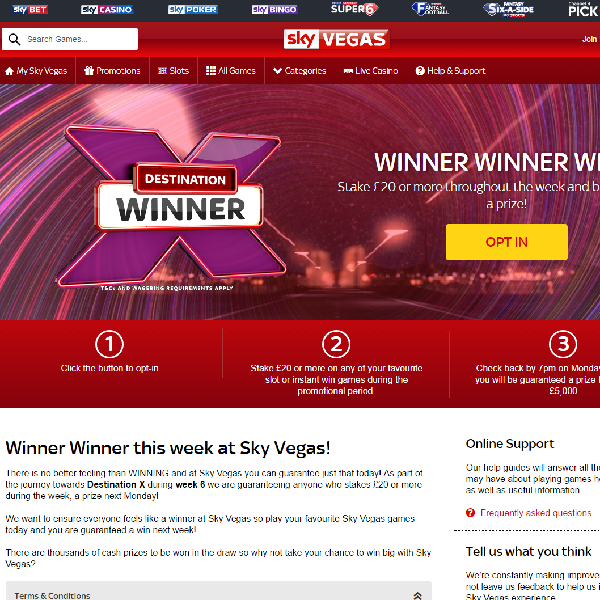 Head over to Sky Vegas today to guarantee yourself a chance of winning the top prize.